CB Services has been providing high quality outdoor services to clients in Maple Grove, and the surrounding northwest metro area, since 2008. We are a local, family owned and operated company, specializing in residential and commercial outdoor maintenance, irrigation, and landscaping services. As a local business, we take great pride in our community and the level of service that we provide to each of our customers. We work with every client to fully understand their needs and the scope of each project. It is our promise to deliver quality, custom work, from snow removal, lawncare, sprinkler service, as well as creating outdoor living spaces and stunning landscape designs. With a combined 40 years of experience in the outdoor services industry, our leadership team of experts is committed to providing exceptional service and care at a competitive price. At CB Services we are fully licensed and insured. We are a member of the Minnesota Nursery and Landscape Association, and member of the Snow and Ice Management Association. As a lifelong resident of Maple Grove, CB Services Owner, Chris Baker attended elementary school and junior high in the Osseo Area School District. He is a graduate of Maple Grove Senior High (class of 2003). After graduation, Chris gained valuable hands-on experience working for a local outdoor services contractor, as well as working as a paid on-call firefighter for the Maple Grove Fire Department. 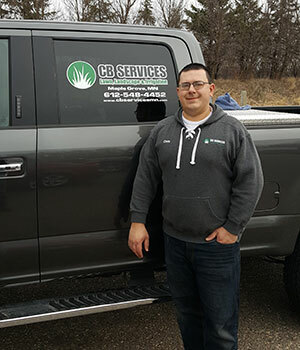 In 2008, while enrolled at the local technical college for a degree in fire science, Chris started a CB Services as a part-time business. His goal was to provide great services to family and friends, who would soon become loyal clients. As the years went on, his client list grew, as did their request for additional services. Realizing that he not only enjoyed working outside, but also working with a fantastic group of clients, he upgraded his business to full-time status in 2011. 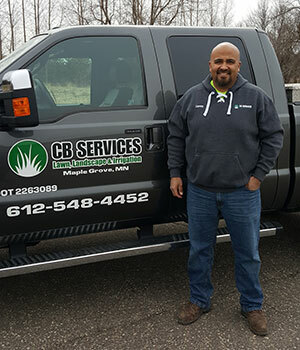 Over the years, CB Services has evolved from a part-time start up into a full-service lawn maintenance, irrigation, and landscaping company. Chris and wife Natalie, married since 2010, are the proud parents to two very active kids, Zachary and MacKenzie. Chris serves as a paid on-call Fire Captain with the Maple Grove Fire Department. When he isn’t busy providing great customer service to clients or chasing after his kids, he enjoys catching a Twins game, sitting by the bonfire, or just getting the most out of the short months of the Minnesota summer weather. At the end of each day, Chris reflects on all the great things that his CB Services team has accomplished and it makes him very proud. Casey, Operations Manager of CB Services, joined the team in 2016. With 20 years of experience and a passion for the business, Casey brings a wealth of industry knowledge and expertise to the position. 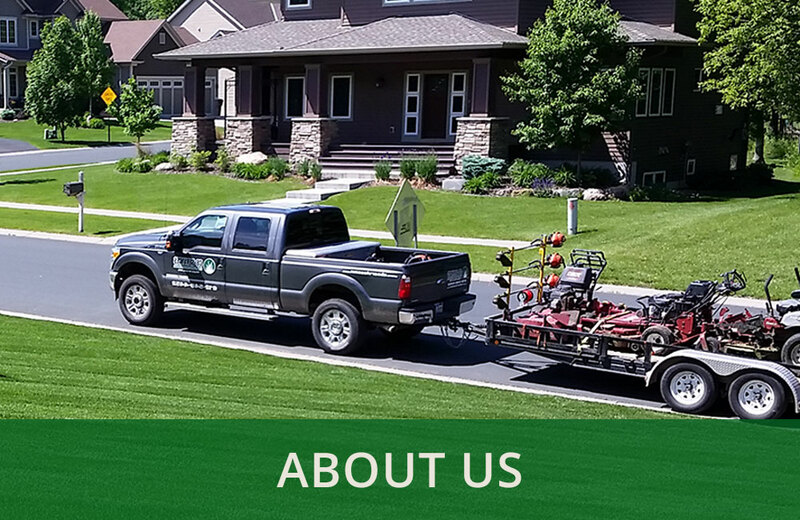 From turf maintenance to landscape design to irrigation installs, Casey truly understands the best materials and current technologies to take a client’s property to the next level. During his high school years, Casey discovered a love for turning yards into works of art, when he worked his first summer job as a lawn tech. As Casey’s knowledge of the green industry grew, he recognized a passion for landscaping. To this day, Casey admits that the most rewarding part of the job is witnessing a client’s reaction when they see their vision turned reality. He credits the hard work of his dedicated team to helping make these dreams come true. Casey, along with his wife and three children, live in Blaine, MN. When he isn’t busy at work, he enjoys spending time with family and friends, keeping up with his kids, and spending as much time on the water as possible. Nicole joined CB Services in 2013. Not only is Nicole the Office Manager, but she’s also family (Chris’s favorite sister). Nicole kick started her career in business after receiving not one, but two Associate degrees from North Hennepin Community College (Accounting and Accounting Technology). She is responsible for bookkeeping, appointment scheduling, client relationship development, and a wide range of administrative assignments. Nicole’s background, along with her organizational skills and attention to detail, keep the office on track and running at high performance. She is excited to see CB Services grow within the community and continue to build strong customer connections! Nicole grew up in Maple Grove, MN. She currently lives in St. Michael, along with her husband, Dan, and their dog, Rocco. In her spare time, she enjoys being outdoors, whether she is hiking, biking, disc golfing, or ice skating. She is also very grateful for time spent with family and close friends. Andrea, another one of Chris’s favorite sisters, has worked at CB Services since 2014. 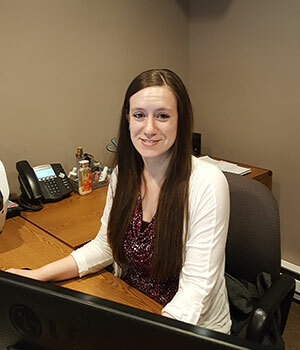 Andrea joined the team as Office Assistant, adding to the day-to-day successes of the growing business. She assists with the management of appointment scheduling, client relationship development, and the administrative assignments of the office. In 2011, Andrea received a degree in Veterinary Technology from Minnesota School of Business. Andrea lives in Rockford, MN with her husband, Nick, and their two children. Working at CB Services has offered Andrea the opportunity and flexibility of raising her children, while enjoying a career. In fact, her kids often accompany Andrea to the office. In her free time, she enjoys working out, being outside in the summer, and playing with her kids and two dogs.